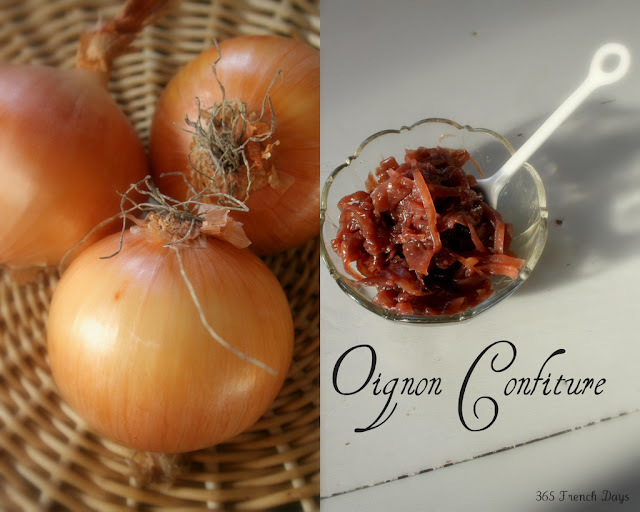 If you want a simple to make yet complexly flavored 'condiment' that is very French and totally fabulous--make a few jars of 'Confiture d' Oignons' or onion jam. I made some last week and we have almost finished the entire jar. Used in bistros on steaks foie gras and terrines, at our house it goes on chops, burgers and duck breast....and adds a punch to panini or basic grilled cheese sandwiches. Chopping up onions is not my favorite thing. I was too lazy to set up my mandoline and my food processor makes a great shredded-dice, but not the long strings or rings that I like best for this recipe. I am still trying to find the 'trick' to cutting up onions tear-free. This time I lit a candle and had it next to the cutting board while I chopped--to no avail. I was sobbing like a baby within minutes (and sneezing too!) Having a very sharp knife does help..... if you know of other tricks, please do share! I use onions a lot! Cook onions with olive oil and sugar and lemon juice for 15 minutes. Add a cup of water and raise heat to medium and cook for 5 minutes. Add honey and cayenne and cook on medium to high heat until the onions caramelize. Finally add in the red wine and cook about 10 minutes. The onions will fully absorb the wine and will become shiny and dark when done. Put in glass jars with a tightly fitting lids to store in the refrigerator. It will be easy to find ways to eat it up--but will last for several weeks if not used immediately! Oh that looks devine. You are such a good cook.